Famous people born on APRIL 20 feel things instead of using their think tank. This is not a good practice. The heart will sometimes lead you astray when it comes to making logical decisions. Also, this is so contrary to who they are because they usually are the levelheaded one in the group. However, their group is small as they like to keep things within a private setting. Famous people born on April 20th typically won’t go to concerts or where there are massive amounts of people. Some of their friends just don’t understand this about them. They think that they are perhaps just a little different from the crew. On the other hand, they are faithful and understanding in their relationships. They get down in the dumps sometimes, but they are able to come out of it soon. 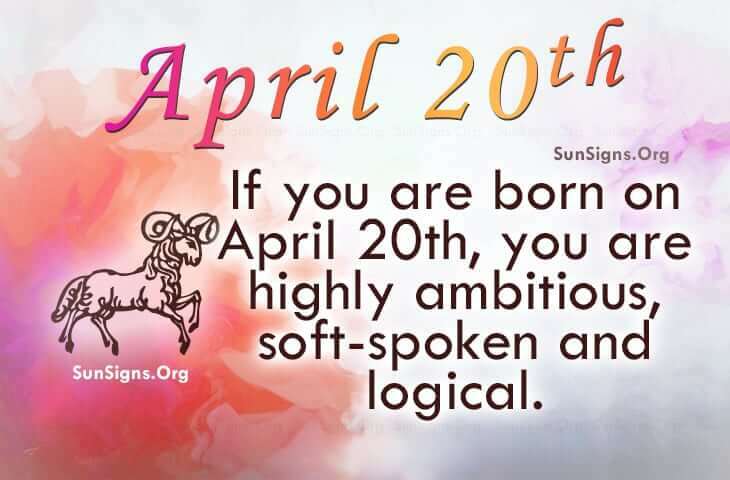 Famous people who share their birthday on April 20th seem to enjoy the tranquility of outdoors. They have a tendency to be soft spoken. They are close to their friends and family. Normally, they keep their promises and are ambitious. This Aries needs to find balance between wholesome eating and fitness.